With DePopper you can clean your sound files recorded from vinyl in a way that you thought was impossible! DePopper cleans most clicks and pops and optionally removes cassette tape hiss, too. You can even clean those tiny clicks that are impossible to remove when using an audio editor - automatically! 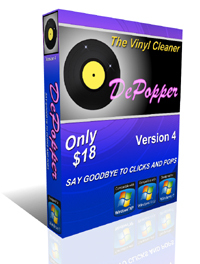 Use DePopper to remove vinyl scratches from wav files, remove tape hiss, bring your 78 rpm records back to you. Use DePopper to restore vinyl records - your rare vinyl records. And you can download the full featured evaluation version to test it during 30 days for FREE! Works automatically with a list of audio files. Removes most scratches without removing trebles. Faster with multi-core CPUs (parallel processing). Tiny resizable screen, excellent for laptops. PDF manual compatible with screen readers. Processes your files while you sleep or do something else. Center channel extractor, for mono sources recorded in stereo mode. Can be used from bat files. Works with Windows XP, Vista, Windows 7, 8 and 10. Faster native 64 bits version available for Win/x64 (7 and above). While keeping all the flexibility of individual settings, DePopper also offers predefined groups of settings for different kinds of sources. You can use them as they are, you can use them as starting points for your own settings or you can create your personal presets, in accordance to your needs. Presets are very useful and are completely optional. You don't have to use a preset if you don't want. All program settings are available individually. The evaluation version of DePopper is completely functional and works during 30 days. If you decide to license the software, you will know exactly what you are paying for! And you pay only once, there are no upgrade fees or lost key code fees! Click the right button of your mouse on one of the two links below and choose "Save As" (or equivalent) to download the Windows® FREE evaluation version of DePopper. Why not? DePopper is powerful and can be better and better if more and more people like YOU register it. The very small fee of $18, paid only once, has been helping us improve DePopper continuously for ten years, since 1999. Your registration will help DePopper to exist for many years in the future and you will benefit from all future updates for free. It's easy! Just click on the left to select the secure payment method you want to use and submit the form. We respect your privacy. We accept PayPal (which accepts Visa, MasterCard, AMEX, etc.). Please check our page of upgrades for bug fixes and patches. We respect your privacy. Click here to see our privacy page. Doubts? Check our FAQ page. *NOTE: in some countries, actual price may change due to extra charges and local taxes for some special payment options.